Ever been bored at home one evening? Nothing on TV? Or just fancy doing something different? Ever thought about change-ringing? Not entirely true. There are old people who ring bells, but one of the many beauties of ringing is that it is done by people of all ages. There are some as young as five or six who ring, but many kids start at around nine or ten and it has been known for people to still be ringing in their 100th year! There're no hard or fast rules on age – if you’re able enough you’re young/old enough! It is open to ALL, whether individuals, a family or a group of mates. By becoming a bellringer you will be entering an interesting, fulfilling and sometimes exciting world full of ready-made friends around the globe, involving travel and discovery. You never stop learning and unlike other pastimes you can join in ANYWHERE. And in these tough times, you’re not obliged to pay anything! Want to know more? Well you’ve come to the right place. 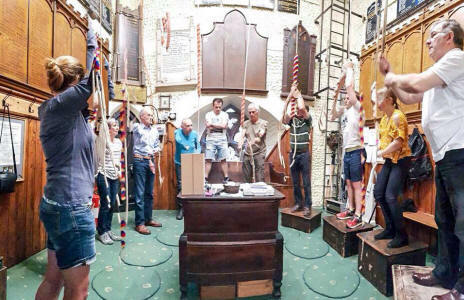 The Suffolk Guild has linked bellringers across the county since 1923 and can start you on the way into this life-changing hobby. 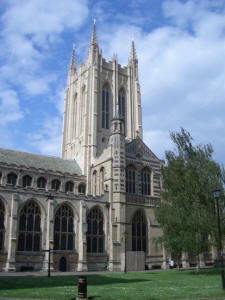 Check out the list of towers (that’s basically churches with bells) to find where near you has bells and who to contact about learning there. Failing that, get in touch with any of the Guild’s contacts. Please explore this site to find out more about what is going on in Suffolk ringing – you’ll be surprised!